If you happened by Pyramid Studios in Tallahassee on Wednesday, March 28, you saw a plethora of uniforms and it was all in the name of good training! 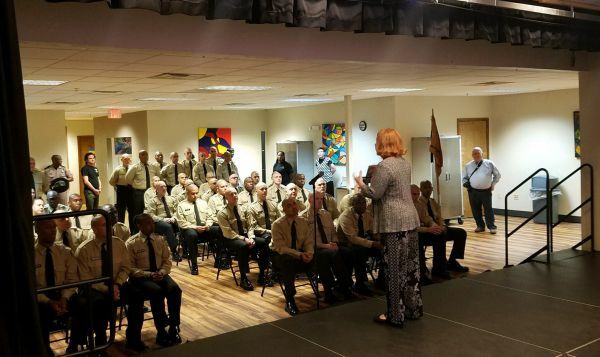 The Florida Highway Patrol Academy 139th Recruit Class' visit was part of an ongoing program and partnership that Pyramid has with the FHP to train each recruiting class on disabilities. Pyramid has been hosting the classes since the 117th recruit class, first at the Pyramid Tallahassee and now at Studios. In addition, The Academy has been a continued supporter of The Players' annual performance, not only donating money but their time to usher, valet park, set up and tear down during the show. A BIG SHOUT OUT and many, many thanks to the FHP Academy for all they do for the students of Pyramid Studios!